The National League One season could hardly have got off to a more dramatic opening, with Fylde pinching victory with the last kick of the match, the accent perhaps being on the term pinched. Chris Johnson was the man of the moment as he conquered any nerves to slot over a penalty deep into injury-time when it looked as though Fylde’s number was up. They had trailed for much of the contest and Loughborough had looked to have won it when they went head 28-20 with only five minutes, plus over-time to go. But it was that man Johnson who saved the day, nabbing 10 points at the death, a try, a conversion and finally a-shredding nerv penalty to break Loughborough’s hearts for they must have thought it was their match for the taking, as might the crowd for that matter. 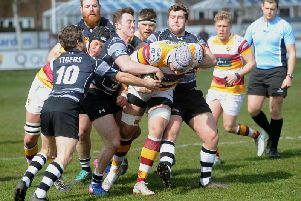 With Fylde 28-27 down and with a penalty to come Johnson did the business and booted his side to five-point bonus win, which had looked highly unlikely earlier in the proceedings. Well before that Johnson had also landed a penalty from half-way, and though he was found wanting with the boot earlier in the game, his late intervention was crucial. That said, this match showed up several of Fylde’s shortcomings, and there is still a lot of improvement necessary. They took too long to get going and were second best for significant periods. But they deserve credit for sticking doggedly to their guns and not allowing their heads to drop. Simon Griffitihs again gave an eye-catching threat up front, while Oli Brennand always proved lively on the wing. It was Loughborough who produced an early bout of sustained pressure on the Fylde line after the home side conceded a free-kick at the scrummage. Fylde managed to withstand a good five minutes of aggression by Loughborough, who soon came forward again, winning a penalty goaled by John Hargreaves on 10 minutes. Blair Hutchison was yellow-carded on 13 minutes for tackling a Fylde man without the ball in the hosts’ first real attack of the game - however, Loughborough managed to repel a series of Fylde raids. It was disjoined start by Fylde in the opening quarter, with the line-out not functioning properly - carelessly they lost too much ball at this set-piece. From one such mistake, Loughborough launched an attack, which resulted in another penalty by Hargreaves that doubled the visitors’ advantage. Loughborough had certainly got the upper hand and Yiannis Loizias and Rotimi Segun linked up dangerously with a swift attack on the left flank. Fylde responded in kind, but faced up to some rugged defence by the Students, who were forced into conceding a penalty on 24 minutes, which Johnson failed to land, which rather summed up his team’s sluggish, unconvincing start. Brennand stopped a possible first try for Loughborough with a timely interception on the wing, but it didn’t stop the visitors’ forward advance. They forced another penalty eight minutes before half-time and Hargreaves’ successful kick put Loughborough two scores in front and deservedly so at 9-0. Fylde needed a boost and they got it on 35 minutes thanks to Warren Spragg - Greg Nicholls had got the moving going with a swift pass along the line and the Fylde full-back worked his way past two or three would-be tacklers to finish off with aplomb. Johnson missed with the conversion kick as Fylde reduced the arrears to 9-5. Loughborough ended the half pounding the Fylde line. For an instant it looked as though a pushover try was on the cards, but stout defence saved the day and there was no further score before half-time. The second half started in downbeat style for Fylde as they conceded after only three minutes. They gave away a penalty and were well and truly caught unawares by a quick tap-penalty by scrum-half George De Cothi - he escaped virtually scot-free as Fylde dithered and he fed a pass to Hutchison, who finished off the move with an unconverted try, but Loughborough were back two scores ahead. Five minutes later, Fylde got back into it in spectacular fashion. Students’ fly-half William Edwards fired out a pass, but instead of going to a team-mate it went into the grateful hands of Brennand, who darted in from distance to take advantage of the Loughborough lapse. Johnson landed his first kick of the game and Fylde had cut back Loughborough’s lead to 14-12. On 58 minutes came a potential turning point in the match. Fylde looked to have won a penalty in front of the sticks, which, if landed, would have given them the lead, but referee Jack Makepeace reversed his decision and brandished a red card at Gareth Rawlings. He was ordered off for an offence of stamping on Loughborough number eight Ben Pons. Despite this crushing setback, Fylde went ahead for the first time in the contest on 63 minutes. Simon Griffiths made a searing break, passing to Scott Rawlings, who then squeezed a pass outside to Jordan Dorrington, who bundled himself over in the corner to no little pain to himself. Johnson missed the kick, but Fylde had the lead at 17-14. It then became 14 men per side - Hutchison received a second yellow card for interfering at the breakdown and got his marching orders. Loughborough were not finished yet and they proved it with a try on 71 minutes to steal back in front. Thomas James fed replacement Jack Pons, who careered through for a try - it was goaled by James to give Loughborough the lead 21-20. This match of changing fortunes tilted very much in Loughborough’s favour on 75 minutes when Ed Taylor pounded over for a try, which James converted. In an exciting finale, Fylde hit back two minutes later - Scott Rawlings burst through and though he did not get to the line Johnson did, converting his own try to trim the deficit to 27-28. But that was not the end of the drama. Brennand nearly skirted over on the right wing, but he was just denied by desperate cover-tackling by the visitors. More attacks followed, though, and Fylde finally got out of trouble in the fourth minute of stoppage-time. Loughborough were penalised at the ruck, and it was all on Johnson to decide the outcome. The fly-half was not found wanting and he landed the angled kick from some 25 yards and Fylde had snatched an unlikely victory. It was a five out of 10 performance for Fylde - but a maximum five points in terms of reward, which is all that matters in the final analysis. Fylde: Spragg (Allen, 40); Dorrington, Briers, S Rawlings, Brennand; Johnson, Nicholls (De La Harpe, 61); Birchall (Lavelle, 53) Mills, Griffiths, Arnold Prisk, 25) G Rawlings, Trippier (Maher, 33) Goodman, Moon.